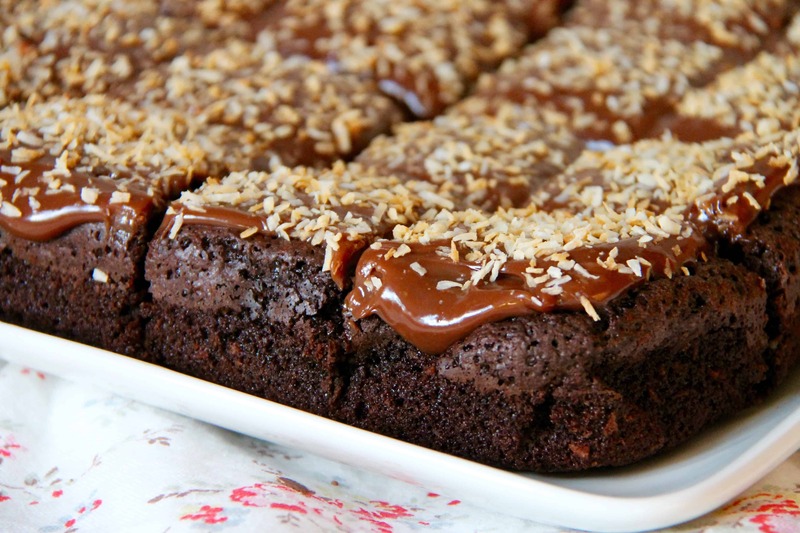 Easy Fudgy Coconut Brownies topped with a scrumptious Chocolate Ganache Frosting & Toasted Coconut! A couple of months ago I posted the recipe to my Oreo Brownies & Cheesecake Brownies and I believe that they were a hit, especially by how many people baked them since then! However, I decided to try something a little different as I had what felt like a tonne of desiccated coconut lying around which I had neglected to use! I asked my families opinion and they all wanted something chocolatey so I thought that the perfect compromise would be a brownie packed full with the deliciously sweet taste of coconut running through it! I found an easy to follow recipe from BBC Good Food here – and thought that would be the perfect place to start – with a few teeny tiny alterations you have these – SO YUMMY! These are super easy to bake as its all in one pan, and then baking in the oven and all done and delicious! Seriously though, the coconut flavour is a marriage made in heaven with Brownies – and I question why I haven’t baked these sooner. I decorate my Coconut Brownies with some Melted Chocolate, or a Chocolate Frosting, then sprinkled with Toasted Coconut! It might seem a little simple but its not too much and over powering, its perfect for them! This recipe makes 16 squares of delicious brownie! 3) Once cooled slightly, stir in the eggs a little at a time followed by the coconut and the flour. Tip into the tin and bake in the oven for 45 minutes. If its browning too quickly, cover with a piece of foil to stop it from burning! 4) Once baked, leave to cool in the tin. Melt some extra Chocolate and then pour over the Brownie, or use my Chocolate Buttercream recipe and slather it over and cut into squares – sprinkle with some toasted coconut (I use a large dry frying pan and sprinkle the coconut in it cooking on a medium heat and stirring frequently until golden brown!) dust with icing sugar and serve! These delicious brownies will last at room temperature, covered, for 4-5 days if they last that long! Older Next post: No-Churn Crunchy Cookie Butter Ice-Cream! Newer Previous post: Chocolate Cheesecake Cups! Hehe sorry about that 😉 and thank youuu! So yummy! These look incredible. Saw them on Instagram and had to come check out the recipe! Absolutely not. Def want to try that recipe out. Looks so good. Ohh haha yay!! I really really hope you like them! There are days when I can handle gluten free but seeing these brownies…today is not one of them. They look fabulous! I shall make them for the kids and just dream I can eat them. Mentioned you in my last post by the way, as I tried your recipe for the chocolate mousse puddings! I’m in love with your blog!! AWESOME recipes and pics ?? Only the truth lol, God bless and thanks for always sharing ?? Reblogged this on The Ziggy Scribe. Anything with toasted coconut is my weakness. These look unreal! Awh hahah thank you! Toasted coconut is SO yummy!